Hillandale has developed a unique relationship with Duke Hospital and the Pediatric Blood and Marrow Transplant Program. Children from around the world are brought to Duke Hospital by their families in order to be treated for leukemia, lymphoma, solid tumors, blood disorders, immunodeficiencies, and rare genetic diseases. The Family Support Program is in place at the hospital to help families deal with the tiresome battle of the disease and they look for opportunities that are healthy and full of family time. The mission of the Hillandale Golf Course H.E.A.R.T.S. 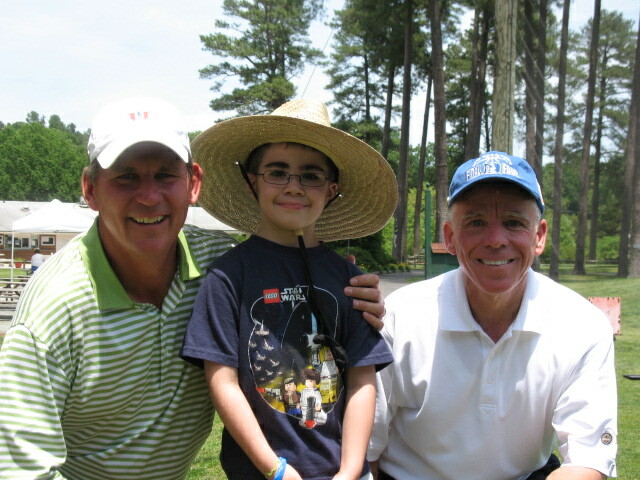 Club is to provide a no cost nurturing golf environment for the children that are patients at the Duke Children’s Hospital Pediatric and Marrow Transplant unit. This program and all it’s offerings will be extended to the children’s immediate families and caregivers in order to ease the burden of their immediate journey by understanding the expense and emotional undertaking of fighting a deadly disease. The goal of this program is to foster an environment that will assist families on a healing journey for their children through the use of golf. Because the children cannot be around large groups of people due to their weakened immune systems due to treatments, golf offers them a wonderful escape and experience. This program gives the children something very positive to look forward to. Hillandale Golf Course has created the H.E.A.R.T.S. Club, an acronym for…..
Children being treated and their family can come to the golf course to get away from the disease if only for a couple of hours. We also embrace the caregivers who need to recharge their life’s battery so they can return to the hospital and fight the good fight with their child. There is no cost and no requirement to the family regardless if they want to play golf, hit some range balls, take a golf cart ride or just sit and breathe the fresh air. All of us here just want to help these very special children and their loving families. Golf is a wonderful opportunity for these kids since they are not able to be around large groups of people. This limits what they can do for entertainment and at Hillandale Golf Course we found this to be an opportunity since what could be better than a golf course? The family is a member of our H.E.A.R.T.S. Club for as long as they are a patient at Duke Hospital. We are proud to be a part of the families of Duke’s PBMT Program and glad that we can be a part of their healing journey. Thank you for playing Hillandale Golf Course!